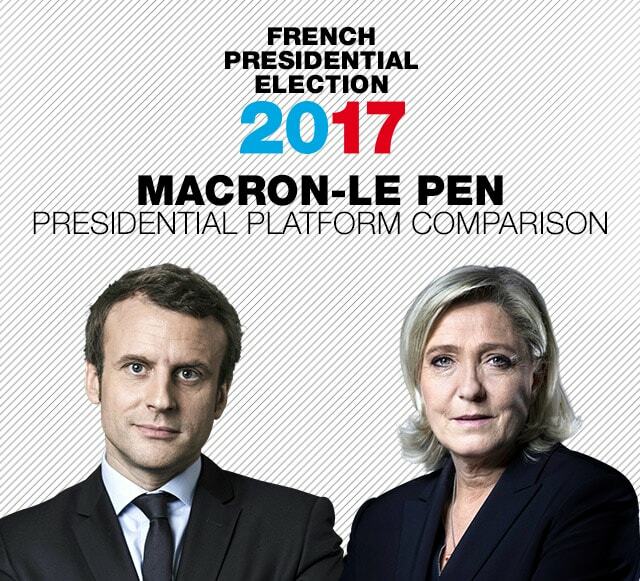 May 7 is the final round of the French presidential election, when French voters will choose between Marine Le Pen or Emmanuel Macron -- candidates who offer radically different programmes. Macron, the candidate for En Marche! (Onward! ), favours a global outlook, a stronger European Union, and a French economy based on free trade. In contrast, Le Pen, representing the National Front, wants to close French borders, withdraw France from the EU and the eurozone, and establish protectionist economic policies. FRANCE 24 compares their platforms side by side, proposal by proposal. Constitutionally guarantee “digital freedom” and repeal the Hadopi Law on Internet copyright infringement. Marine Le Pen advocates for “intelligent protectionism” and “a new patriotic model in support of employment”. Create the position of Economy and Finance Minister for the eurozone (the group of countries that hold the euro currency), as well as a eurozone budget. The latter will have three purposes: forward-looking investments, emergency financial assistance, and economic crisis response. “Restore order to the French Republic – the law everywhere and for everyone."